Rates provide the majority of income to most shires and are the vessel that allows core services of local government to occur. A sizable amount of these funds is expended on roadworks but it also provides for the development of the shire as a whole to ensure services and development of assets requested by ratepayers occur. Like most businesses, there are limited funds and unlimited requests and council endeavours to allocate these scarce resources to the most needed areas. You may receive an additional (interim) rates notice at any time of the year if you make building improvements on your property, subdivide or demolish a building on your property. The assessment of rates or taxes is based on an equitably assessed value provided by the Valuer-General, Landgate. Under the Valuation of Land Act 1978 any person liable to pay any rate ot tax assessment in respect of land (for local government rates, the owner) including the authorised representative of such a person may object to the value used as a base and may serve upon the Valuer-General a written objection to the valuation, within 60 days after the date of the issue of the rate or tax assessment. Rates must be paid as assessed irrespective of whether an enquiry has been lodged. All enquiries to: www.landgate.wa.gov.au or call 08 9273 7373 . If you are selling or buying a property, your settlement agent will advise the Shire of the date of sale and the new owners address and will arrange an adjustment of your rates. If you are not using a settlement agent, you should contact the Councils Rates Department in writing advising the new owners details, settlement date and a copy of the Certificate of Title. This can be emailed to rates@dandaragan.wa.gov.au or posted to Shire of Dandaragan, PO Box 676, Jurien Bay, WA, 6516. Please include the property details, owners full names, previous address and new residential and/or postal address and contact numbers. Post: Shire of Dandaragan, PO Box 676, Jurien Bay, WA, 6516. Pensioner and Senior card holders may be entitled to claim a rebate. The rebate is applicable to Rates, Specified Area Charge and Emergency Services Levy only, with all other charges to be paid in full. To be eligible you must be the owner and reside in the property on or prior to 1 July of the rating year. You must register your entitlement with the Water Corporation (concessions only apply once your application is received and registered). To apply for a concession please go to www.watercorporation.com.au and click on ‘Apply for a Concession’, call 1300 659 951. Council has resolved that an interest rate of 10% per annum, calculated daily by simple interest be applied on all overdue rates. Interest will start accruing after the due date, being 35 days from the date of issue of the rate notice. Council has resolved that a discount of 5% will be allowed on current rates if payment for all rates and charges is received by 5:00pm on 28 September 2018. It is YOUR responsibility to ensure that full payment is received at the Shire by the due date to claim the discount. Under no circumstances will a discount be considered for payments received after 28 September 2018. Council offers ratepayers an opportunity to win one of three prizes, provided that full payment of all rates and charges is received by 5:00pm on 28 September 2018. You were automatically entered into the draw if full payment of all rates and charges were received by 5:00pm on 28 September 2018. 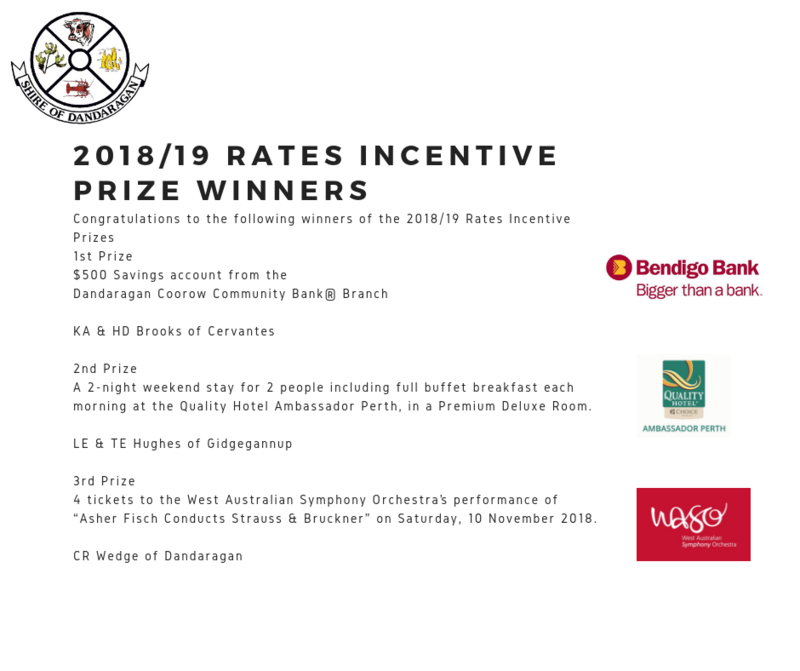 Congratulations to the following 2018 / 19 Rates Incentive prize winners. Option 1. Payment in full, with 5% discount if paid by 5:00pm, 28 September 2018. Option 2. Payment by 4 instalments incurring an administration fee of $20.00 and an interest charge calculated at 5% per annum. An additional interest charge calculated at 10% per annum will accrue on each late instalment. NOTE: Instalment options are NOT available if arrears and any interest that has accrued up to the date of issue of the notice are not paid by the due date. If arrears and accrued interest are not paid in full by the due date, interest will continue to accrue on the arrears from the date the notice was issued, until paid. Ratepayers experiencing difficulty in paying rates and charges should contact Council’s Rates Department on 08 9652 0800 or rates@dandaragan.wa.gov.au as soon as possible to discuss alternative arrangements. The Emergency Services Levy is forwarded to DFES to fund the Career Fire and Rescue, Volunteer Fire and Rescue Service, Bush Fire Brigades, SES until and DFES units throughout Western Australia. Rebates apply to this levy under the Rates and Charges (Rebates and Deferments) Act 1992. For more information please refer to the ESL section of the DFES website www.dfes.wa.gov.au or enquire on freecall 1300 136 099. Late payment interest of 11% per annum will be charged to property owners who fail to pay the required full amount or part payment of ESL by the due date. Council has resolved to impose a rate of 7.8972 cents in the dollar for all Gross Rental Values for 2018/19. Gross Rental Value (GRV) general valuations are carried out once every three to five years in country areas of WA. During 2017/18, general valuations were conducted within the Shire of Dandaragan, all of which will have a Date of Valuation of 1 July 2018. Should you have any queries regarding your valuation, please contact Landgate directly on 08 9273 7373. Rates must be paid as assessed irrespective of whether an enquiry has been lodged. While overall rates yield has increased by 1.9%, at the individual assessment level changes will vary. Council has resolved to impose a rate in the dollar of 0.7622 cents for all Unimproved Values for 2017/18. Each year the Valuer General assesses all UV properties and provides the Shire of Dandaragan with a new valuation. In the past, this valuation has generally been calculated by analysing sales in the locality around the Date of Valuation. The Valuer General is in the process of changing its underlying methodology for valuing UV properties and this has resulted in a significant shift in some valuations. Should you have any queries regarding your valuation, please contact Landgate directly on (08) 9273 7373. Please present this account intact when making payment at Jurien Admin Centre, Dandy CRC or Australia Post. Call your financial institution to make this payment from your debit card. To make payment over the phone please contact 1300 766 981.